The debate over raising the debt ceiling is now focusing on an important issue the rating agencies have highlighted, i.e., the deficit itself and the level of the governments debt. The difficulty some members of Congress are having has to deal with the apparent lack of cuts in the early years of both Reid and Boehner's agreement. As an example, in the Boehner plan, the cuts are very little in 2012 and is very much back end loaded. The Reid plan is no better in reducing the deficit as well. Paraphrasing from a recent article on Zero Hedge's website, the CBO’s scoring of the Boehner budget proposal comes to a deficit reduction of $851 billion from 2012-2021. However, this plan is heavily back end loaded and, on a net present value basis the reduction is only $50 billion. The current federal deficit is about $1.4 trillion this year and growing; hence, some members interest in Congress to focus on expenses. Every year that passes without addressing entitlements, the more painful the medicine might be. It is becoming increasing likely the August 2nd deadline is not met. If that is the case, what is the impact on cash levels at the Treasury? It appears the Treasury has enough cash until 8/12 and could probably get to 8/15, an interest payment date. This is highlighted in a Reuters article this morning. The table assumes that the Treasury will be able to at least roll over maturing debt on August 4, 11 and 15. See below chart from Stone & McCarthy research. Both plans are highly likely to lead to a lowering of the government's credit rating given the reduced focus on the deficit and debt level. Which countries are impacted the most in a debt default, assuming it does occur. 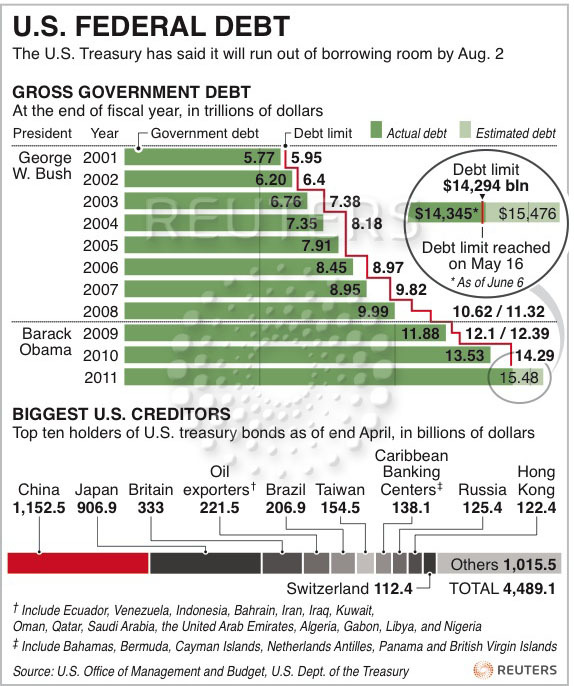 Below is detail on the foreign holders of U.S. government debt. The trend in the debt holdings is available from the U.S. Treasury site. Raising the debt ceiling itself is not the issue facing Congress and the U.S. government. As the below chart shows, Washington seems to do a good job issuing new debt up to the maximum limit each time the debt ceiling is increased. The result of Congress' propensity to spend is the government's budgeted expenses now far outpace incoming revenues. In fact, the government now borrows 40 cents of every dollar it spends as noted in the below chart. The stickiness of the unemployment rate is contributing to this gap in expenses versus revenue. The below chart shows the "income security" spending component of the government's budget has nearly doubled to $603 billion from $374 billion since the beginning of 2008. This increase in the "income security" portion of the budget is highly correlated with the unemployment rate. The "income security category" includes unemployment compensation, housing and food assistance. Not many CEOs have commented on the impact Washington's policies are having on business decisions, primarily the desire by businesses to increase employment. However, during a recent Wynn Resorts investor meeting, Steve Wynn, CEO of Wynn Resorts (WYNN), noted the difficulty businesses are having navigating the new policies and regulations coming out of Washington. The audio of a portion of that meeting can be heard at this link: Wynn Investor Meeting audio. If politicians in Washington would simply develop a credible plan that reduced spending and created an environment that was conducive to growing revenue over some reasonable time frame, say ten years, the business environment in the U.S. would likely improve. It is nearly impossible to turn to any business or news program where the lead story is anything but commentary on the debt ceiling debate going on in Congress. As we noted in our 2nd Quarter Investor Letter published on Monday, the real issue is not simply raising the debt ceiling, rather the growth in the debt itself. As the below chart shows, Congress has the unique ability to increase the Federal debt (spend beyond its means) every time the ceiling is raised. The more significant issue facing the government is developing a plan that reduces the government's overall debt. At HORAN Capital Advisors we do believe the debt ceiling will be increased and if it occurs after the August 2nd deadline, the delay will not have a negative long term impact on the economy. A key will be whether spending reductions are incorporated into any debt ceiling increase that passes Congress. From an economic perspective, we noted in our recent newsletter that the steepness of the yield curve and bank lending are suggesting a better economic environment ahead. As the below charts detail, the 13-week rate of change in loans and leases at commercial banks has turned positive, i.e., above zero, for the first time since January 2009. Additionally, the below chart shows the steepness of the yield curve (fed funds versus 10 year treasury). This spread is near a record high and historically recessions have been 3+ years into the future; hence, a double dip recession does not seem to be just around the corner. Lastly, recent earnings announcements have been coming in on the strong side as 75%+ of companies that have reported have exceeded expectations. The debt ceiling debate is top of mind for investors and the market and our our recently released 2nd Quarter Investor Letter includes commentary on this issue. We hope you find the content of our letter insightful as we look to the balance of 2011. HORAN Capital Advisors' complete Investor Letter can be accessed at the following link: 2nd Quarter Investor Letter. The below video provides a clear summary of the current debate. Lastly, Karl Denninger of The Market Ticker, provides a detailed summary of the debt issues facing the U.S. in a post titled, The Truth About Budgets, For Both Left and Right. It is an article that should be read in order to better understand the debt issue debate. By clicking the below graphic, readers can access estimated earnings growth rates for the S&P and its sectors through 2012. Beginning in Q4 2011, financials are expected to show the strongest growth in earnings. Only time will tell. Emerging market economies are at risk of overheating; however, many emerging countries are working to stem growth in an effort to prevent a hard landing of their economic growth. The countries at highest risk of overheating are detailed in the below table. The factors that make up the overheating index are displayed in the below interactive table. Stock buybacks and dividend increases for companies in the S&P 500 Index have certainly been on the mend since the end of the financial crisis in 2009. For the first quarter, and on a year over year basis, dividends are 13.7% higher, buybacks are 62.7% higher and buybacks plus dividends are higher by 39.6%. In addition to the improvement in buyback and dividend payments, company cash balances now exceed a record $1 trillion, a 14.6% increase versus Q1 2010. It would certainly be positive if companies had the confidence to commit some of this cash to larger dividend increases. Below is a table containing the top 10 S&P 500 companies ranked by per share cash balances. Instead of showing as cash, these transactions should be classified as receivables. The article notes other liberties taken by companies with the classification of cash assets. Certainly, corporate cash balances are higher; however, actual cash may note be as high as it seems. In our post in mid June titled, Market Adjusting To Slower Growth Economic Environment, we noted the put/call ratio had climbed to 1.1 and was at a level last reached at the market's low in March 2009. At the time of our post, the S&P 500 Index was trading at 1,271. Since that time the put/call ratio has declined to .56 and the S&P has rallied to 1,339, an advance of 5.3%. The ability of the market to move higher in the coming week's may hinge on the market's view on a number of economic reports next week: durable goods report on Tuesday, jobless claims on Thursday, private payrolls, unemployment rate and wholesale inventories on Friday.